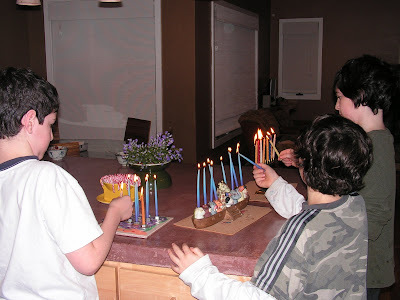 Tonight is the end of Chanukah for 2007. The candles are burning and the kids are showering. We’ll spend the evening playing games and cuddling and talking. And I am grateful. Grateful for a family that I love to be with. So I didn’t have time to finish the book I sat down to read today. The boys had too much to share. And I didn’t have time to chat with a friend. But I got to hear Max play the sax. And the house isn’t as neat as I like. But I read Davis’ research report and I got a demonstration of the neato machine Reed made with Lego and I got to lounge and pet the cats. I’ll go to sleep tonight feeling happy. < We are family. I got all my sisters with me. well written – it’s so important to take the time to be thankful for those little things! It sounds like a wonderful holiday. Thanks for reminding me to take time to remember the important things.